This all natural recipe helps reduce the appearance of cellulite, you can use it on your whole body or one area at the time. It really is working for me and I apply it one to two times per week. I hope it works for all of you too! 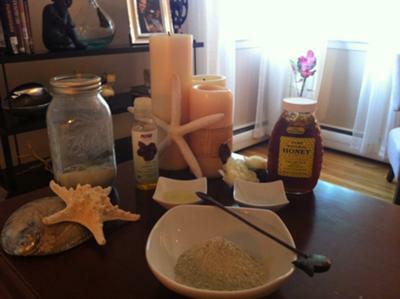 - In a glass jar mix the seaweed and the clay, replace the cap and shake well. In a separate bowl put just the amount you will use and mix it, using a wooden spoon, by adding natural lime juice until you get a paste like constancy, add the honey (BTW! great moisturizer) and if needed some water to get the mixture right. Only mix what you can use. Apply mixture to clean and dry area then cover it with plastic film wrap (the stuff you use to wrap your sandwiches), leave on for at least 25 minutes, rinse with warm water and moisturize with either jojoba oil or coconut oil. Store the remaining unused dry powder mix in a cool and dry place for you next application or facial. This a great way to nourish your skin!! If you have tried this please leave a comment and tell us how it worked for you.